Do you remember where you were when you heard the news that planes had been hi-jacked and were crashing into buildings? I was in Rio Rancho, NM on September 11, 2001. I was getting ready for my day when the phone rang. Pam, our church secretary, called to tell me to turn on the news. I was standing in my bedroom and turned on the TV. The first plane had hit the first tower. While watching moments later the 2nd plane hit. I recall hearing about another plane hitting the Pentagon… and yet another plane missing. We all know the missing plane crashed in Pennsylvania. It was shortly after this day American Flags started showing up everywhere! If one didn’t have a flag on the car you looked a bit out of place. “United We Stand” became slogan for the day and the years ahead. I pray we will not forget September 11, 2001. I pray we will not let our guard down again. Today’s news seven years later leaves us with questions about North Koreaand Iran. Russiais in the midst of performing military exercises hosted by Venezuela. Osama Bin Ladan is still at large. Iraq is showing progress and more attention is being placed on Afghanistan. Israel seeks to defend her Nation in the midst of threats from Iran. With new challenges on the horizon lets not forget September 11, 2001! 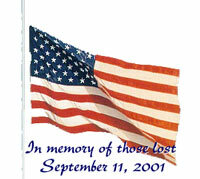 I recall listening to “All for One” by STRYPER in those days that followed 9-11-01. If I had the gadgets and gizmo’s to make a video in memory to 9-11 – I would use this song. Is there love to be found in this world’s pain and misery? Thank you to patrioticon.org for the flag photo. I was sitting in Chic-Fil-A with Rocky Thompson the then pastor of the Vineyard. We were meeting for the first time to get to know each other when the call came to us to get to a tv. I must have logged 100 hours that week in front of the tube. Life changed that day didn’t it. And please keep the Stryper comin’. I love it. I had just passed the gas Station before the Catawba River on Hwy 70 after meeting with the ministries accountant. Got to a tv and saw the plane hit tower 2 live. I cried a lot that day. As reports came that it was Muslim extremist thoughts went almost immediately to pray for the protection those Muslims in our communities and that Christian would be the ones to show the love of Christ to those Muslims in our community.